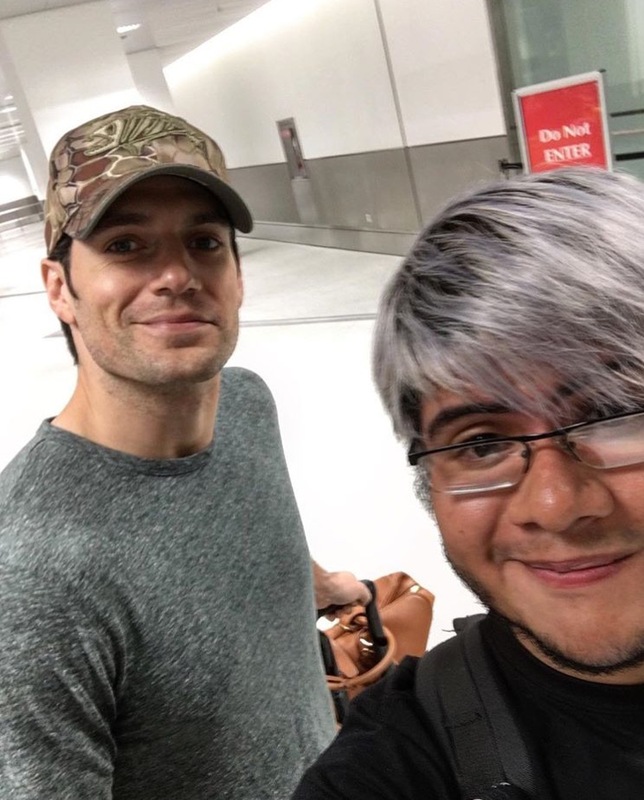 Azaeziel: "Besides the exhaustion in my face, I flew with and waited for my bag with Superman! @henrycavill @iflymia #firstclass #superman #henrycavill #britishairways #travel #miami"
Have a safe trip Superman! -- Thanks for sharing (you very lucky) Kevin. Awks he has a girlfriend. I guess a not so favourable comment was left in order for it to be removed. SMH. People need to get over the fact Henry's happy. From what we know as of current he has one, let's leave it at that. Until he shows up with another. Tc. OMG he looks like Immortals Henry!!! Anonymous August 23, 2016 at 6:11 AM - I think he's in the states ready to start shooting the next part of JL1. Not all of the movie will be shot in London. Henry's probably over there having a little break with loved ones before production starts again so he's already there. Exactly. People are so ignorant when it comes to what he's upto and forget the fact that he has an actual job that can relate. Like research people! You're right. People are too invested in his private life than anything else sadly. Nobody knows. It could just be a stop over to another destination. he's gone through Miami before enroute to other destinations. There was a pic a few years ago. We'll find out if/when we're supposed to. Oh my gawd. I love that guy's shiny hair!so glossy! Who cares why he's there or wherever he's going! Why do fans always have to know all his whereabouts, it's bad enough the stalkers hound these instagram pics with stupid questions as it is. It's beyond creepy. Let the man live and enjoy himself. In other news, Henry looks really well and I'm lovig that fans' hairdo! Seriously!!! It's embarrassing. That lady who posted her selfie a few weeks ago from Jersey has now locked her account. She's not the first to do that. When will they learn?! They don't realise they are giving all the decent fans a bad reputation. Omg! Right! I'm embarrassed by the fact they exist. Sometimes, I want to bury myself into my pillow and scream when I see comments like those, hoping to notice something relates without having to pass those people. I do say things like "OMG I LOVE YOU" on his instagram but it's not like I want to stalk him or harrass anyone close to him. I just want to express my love for him as an actor and a person with so much sincerity. It makes you melt, doesn't it?? Scary instagram posts I've seen on HC's one are mainly desperate people posting "dm me henry pls"
I think you've gotten the wrong end of the stick Charlotte. It's the ones that comment on every single picture, sighting, post of Henry that ask where exactly he is, who he is with etc etc, that act like 'stalkers'. It's the same group over and over again. If you post without needing to know the absolute minute detail regarding him then you have nothing to worry about. Yeah, they're mainly from a specific website, which we shouldn't mention because that site grosses me out. People's attitudes towards fame over there is horrendous, like as if they're leading the same life as these famous people are. They don't necessarily understand the struggle of having to be in the spotlight 24/7, whether it be by fans or paps. They don't understand that society can choose to reject them or choose to love them from the way they present themselves, it's hard. I'm glad we haven't seen the angry/annoyed side of him, I wonder how he does it. Unlike most other celebrities who would push fans away then apologise later on. Have you seen Henry apologise once? No, because he's never done anything to go there. If he can be so nice to us and respect us, why can we do the same? Why can't we leave what goes on in his personal life to himself. It's not like some random person is coming up to you and saying "hey are you single" then posting it all over a website and calling it a breaking news. Sorry, got emotional. I just hate it when people cross the line. I don't mean you ladies/gentlemen. I meant the trolls. HCN, you can delete this comment if you feel it's inappropriate. It's the fact that they seem to believe the things going on in their heads. The reasons they create for the littlest thing are unbelievably odd. As if they know how HC's own mind works. There is one on there who seriously believes all the women HC's been close with have stolen her identity and post things to pee her off. Every single one. Like WTH! I only thought they bullied his gf. All of them. I also tried to back up one of his exes at the time and they ganged up on me, out of nowhere. It was so harsh. And they kept saying I could be the actual 'girlfriend' posting these compliments. And now when I tried to be nice about his new one, same response by the same people. I felt like I was being bullied myself. Like my right to post actual nice things was being taken away and had turned into something 'wrong'. I was in such disbelief for 2 days and I stopped logging into social netowrks because of it. Too many hate going on around. Until the hate crime dissolves, I'm staying away. Don't worry Anon - @2:37 PM I've had the same experience as yourself. They bully anyone he is seen with and contact anyone who may be just in the same photo with him even if they're in the background. Just that the gf's get it even worse due to jealousy! They also try to delve into new posters of that same site to work out who they are in real life. They've been known to create files on people and even go further as to contact the FBI, the FBI of all things because they "have a need to protect Henry" and that is only a fraction. SMH its crazy! There's a reason many fans haven't bothered with that site as they know how vicious it is. It's a hate site despite that they say otherwise. It's because those ones who are nasty are apparently from a group, is it? I don't know, but there was 3 of them and I specifically remember feeling upset and getting a slight anxiety attack from that. Even though it was short, literally two comments from my end, it hurt me because they didn't stop and started saying things about me without truly knowing me at all. It's mainly from haters who have a hate group on Facebook and Instagram. I suppose jealousy can drive people crazy and say mean things about people without knowing them at all. Those people need to search for their inner zen, to help them recover from whatever they're feeling, so they can follow the positive route once again. They were not born mean, they were born to learn. Learning the positive aspects of life can refresh a persons mind and soul. I wouldn't want to get into an argument and have them be horrible to me again. Once I get onto social networks again, I will tell a hater to see the light, the bright side of things. I highly doubt they will do so, as people like that tend to often use a lot of irrelevant sarcasm and make jokes about it due to negative influence from their peer groups. Which makes me sad. Sorry, if my posts seem long. Before I click 'publish' I try and be positive. It all started when I lost my travel card. I told myself, there's always a solution for everything. Then I bought a new one. My motto is: be positive and everything will go right. Even if you're having a crappy day, smile. I'm okay. I'm pleased to know that there is good out there. Thank you for that reassurance. It does help to see people's funny and meaningful comments that brighten my day, while getting me thinking about things that I can relate to myself. Sometimes you need a dose of HCN. Right. Same sources posted wrong news about Ben/Batfleck's relationship (with him having another child with his wife) and guess what: Untrue. Where's the bump? Lol. Do not read anything that has NOT been confirmed by anyone assosicated with the celebrity or the celebrity him/herself. I repeat DO NOT READ WHAT'S NOT BEEN VERIFIED OR HAS FALSELY BEEN CLAIMED TO BE VERIFIED WITHOUT REAL VERIFICATION/PROOF. And stop making excuses on this gorgeous piece hunks relationships. HIS choice, remember, whether you like it or not. You control your own feelings. Also, when the news broke out, it was false from start and made 0 sense. As of now, it could be different. But I'm talking about when it (fake sources) happened, it was UNTRUE. Know this, Henry is enjoying his vacay while wearing a GREEN LANTERN shirt. *mind blown* Truely a DC fan, I'm shedding a tear right now. May have made spelling mistakes, but I am not in the mood the read over and correct em' sorry! Lots of love. Tabloid fodder should be ignored completely. There is ever very very very little truth in them. And god forbid anyone believes the things The Sun publishes especially with the heartache they caused with all those wrongdoings they carried out. reading* my G just disappeared, my apologies.